The D13VG 1/2" 0-650 RPM Drill drills into various types of metal, wood, plastic resin, stainless steel and similar materials. This model also tightens and loosens small screws, wood screws, nuts and bolts. Very solid performance. Haven't had any trouble with mine. Really powerful. Contractor strong but still compact. Side handle extension a plus. I purchased this Hitachi to replace a supposedly-heavy-duty 1/2" Craftsman drill that ground down to a halt in the middle of its infancy. (I was drilling sheetmetal for a seat bracket, nothing special, and it flat died. This was roughly the tenth time I had used the drill.) After asking some friends in the know and researching amp/torque levels online, I began looking for the Hitachi. By getting an Amazon C/C I ended up paying a hair over $100. I couldn't be happier. In the last month I have drilled fence brackets, sheetmetal and seat bracketing, and a few rubber bushings from their shells. Not a whimper came from this drill. I have one caution to offer: Use the side handle. 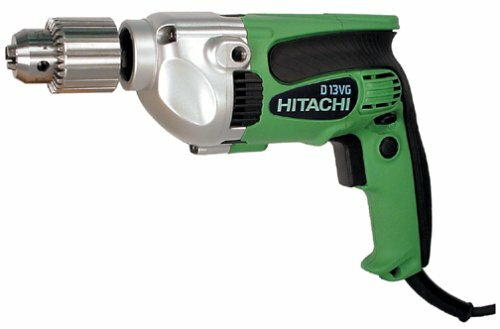 Hitachi offers not just a screw-in handle but a steel extension to give the user more leverage against the drill. If this drill catches the material it is drilling, the force of the drill will cause one of three things will happen: The bit will break, the work will break, or you will have the opportunity to fight the torque of the drill (650 in-lb or so). Trust me, it will try to twist you around the work if you aren't prepared. This is no criticism. The drill is just that strong. Two bonuses are its size and comfort. The notch on the back of the grip is perfect for using the free hand to steady the drill in lighter jobs, and the body of the drill is more compact than some lesser drills. For a drill with a 1/2" chuck it handles like some lightweight 3/8" models I tried. No need to switch to a smaller drill for lighter jobs due to comfort or size concerns. Sure, it's heavier than smaller drills, but that weight is an asset in steadying the work and fighting through any small catches of the bit in the work, the kind that are over before you realize anything snagged. 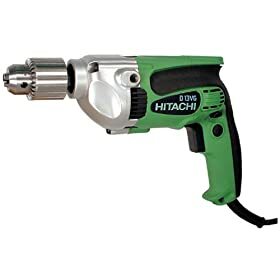 A word to the wise when shopping: There is a Hitachi with a similar part number (D13VF) that has a 9.0 amp rating but far less torque, somewhere around 460 in-lb. The price is similar. You give up torque for more bit speed. I needed the torque, hence my choice.